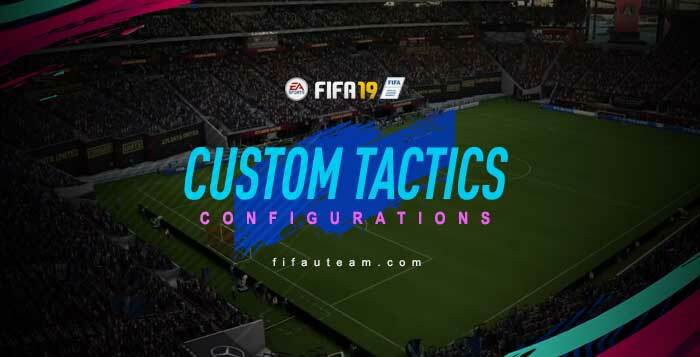 Are you out of ideas about how to customise your own custom tactics for your FIFA 19 Ultimate Team squad? If you want to see your squad playing the way you want, check our selection of the best FIFA 19 Custom Tactics configurations from real clubs and our own suggestions. If even after reading our custom tactics guide for FIFA 19 Ultimate Team you still don’t know which values to use, maybe we can help you. On this page, you’ll find a selection of the best FIFA 19 custom tactics based on your game style and on the teams you support. Remember that there are no perfect tactics and you should use the ones on this page only as a reference, while you don’t discover your own configuration. The team will try to defend deep and absorb pressure, getting numbers behind the ball. The team will try to defend deep but will also try to build-up the attack. The team will try to be as balanced as possible on the defence and on the attack. The team will try to put more players on the attack. The team will build up fast attacks taking more risks on the defence. The team will try to defend deep and absorb pressure, getting numbers behind the ball. This configuration is a FIFAUTeam suggestion. The team will try to defend deep but will also try to build-up the attack. This configuration is a FIFAUTeam suggestion. The team will try to be as balanced as possible on the defence and on the attack. This configuration is a FIFAUTeam suggestion. The team will try to put more players on the attack. This configuration is a FIFAUTeam suggestion. The team will build up fast attacks taking more risks on the defence. This configuration is a FIFAUTeam suggestion. The team will try to play with a style of play similar to what Arsenal uses in real life. The team will try to play with a style of play similar to what Atlético de Madrid uses in real life. The team will try to play with a style of play similar to what Chelsea uses in real life. The team will try to play with a style of play similar to what Juventus uses in real life. The team will try to play with a style of play similar to what FC Barcelona uses in real life. The team will try to play with a style of play similar to what FC Bayern uses in real life. The team will try to play with a style of play similar to what Manchester City uses in real life. The team will try to play with a style of play similar to what Manchester United uses in real life. The team will try to play with a style of play similar to what Paris Saint-Germain uses in real life. The team will try to play with a style of play similar to what Real Madrid uses in real life. The team will try to play with a style of play similar to what Argentina national team uses in real life. The team will try to play with a style of play similar to what Belgium national team uses in real life. The team will try to play with a style of play similar to what Brazil national team uses in real life. The team will try to play with a style of play similar to what England national team uses in real life. The team will try to play with a style of play similar to what France national team uses in real life. The team will try to play with a style of play similar to what Germany national team uses in real life. The team will try to play with a style of play similar to what Italy national team uses in real life. The team will try to play with a style of play similar to what Netherlands national team uses in real life. The team will try to play with a style of play similar to what Portugal national team uses in real life. The team will try to play with a style of play similar to what Spain national team uses in real life. How to play Liverpool style?